Tea with Mary Kate finds seemingly ordinary events, and seeks to show how special, how connecting each of these shared experiences can be. For those familiar with the film “A Quiet Man”, there are several scenes at the train station. The arrival of Sean Thornton and more memorably, when Mary Kate looks to flee to Dublin. I adore that scene when Sean slams shut all of the doors to look for Mary Kate, eventually finding her hiding in Third class. 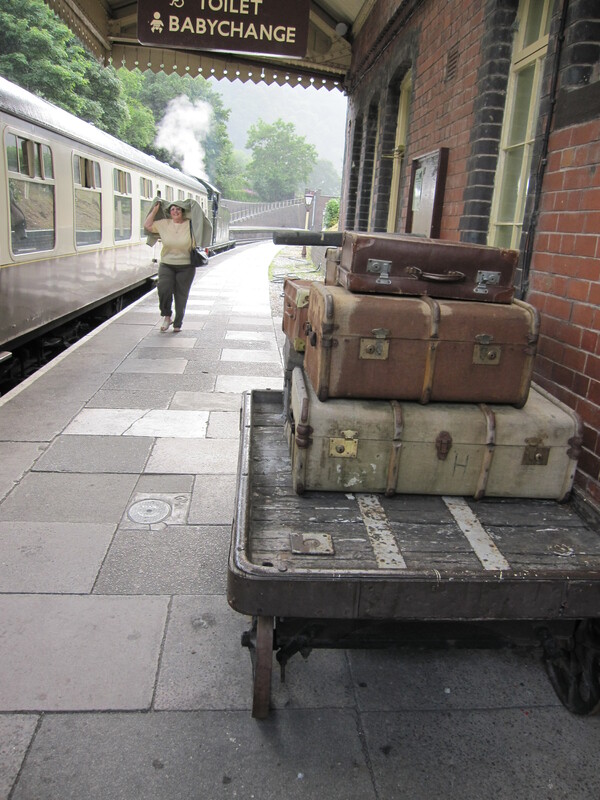 Standing on the platform of Llangollen steam railway station instantly transports you back to another era in time. 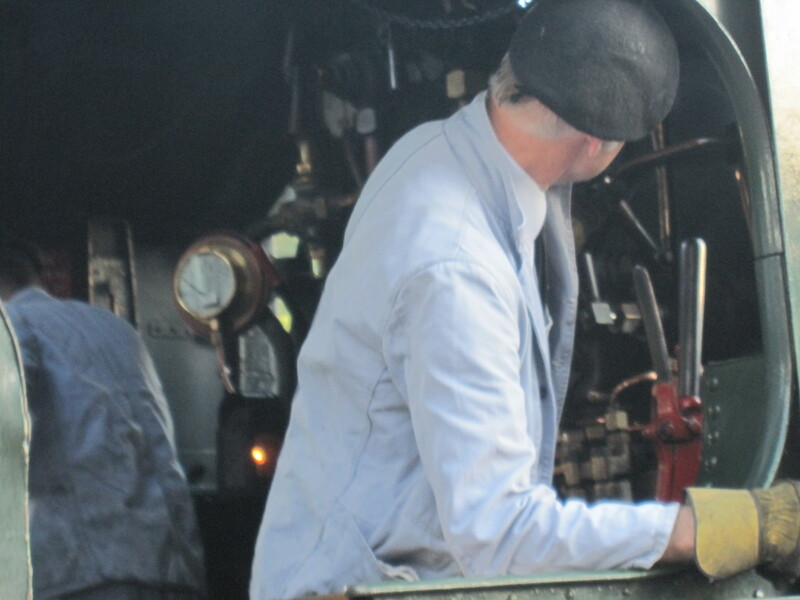 The station is how you would imagine it to be, with its original luggage, and the crew and station master suitable attired, the station instantly manages to evoke the golden age of steam. The Llangollen train’s are magnificent, the steam is hissing, the carriages resplendent. 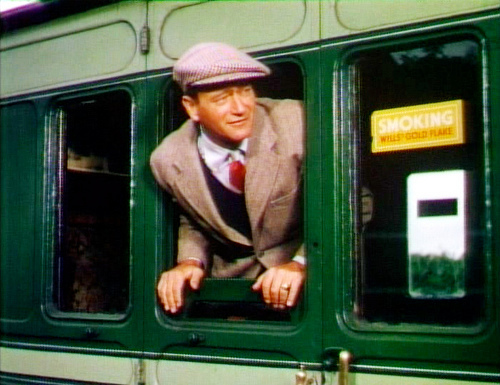 It reminds you this was a time when steam travel was how everyone travelled in Britain. 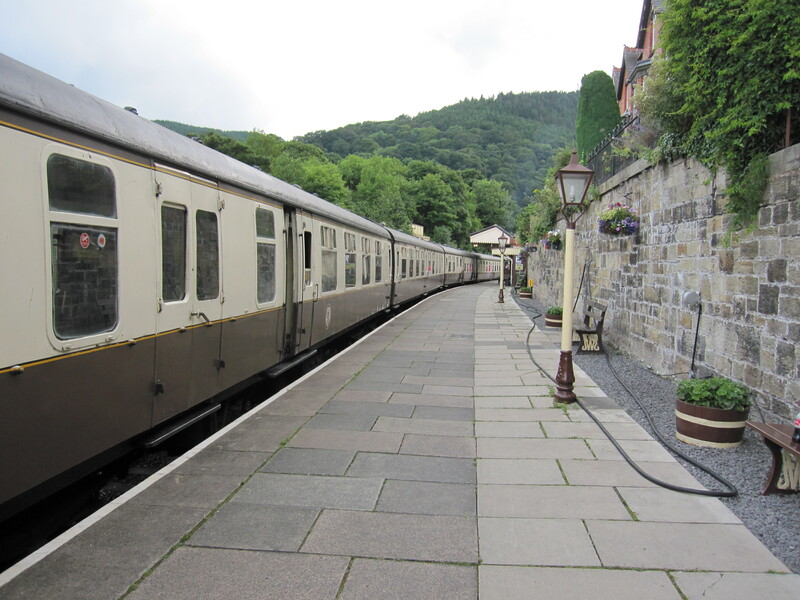 The journey you take is magical, with the gentle movement of the train, the noise and sight of the steam trailing back over the roof, next to the River Dee for much of the journey, and through some of the most beautiful & scenic countryside of North Wales. And there’s more good news – plans are afoot to expand the 7 1/2 miles of track even further, with a Corwen extension, including a new station, which is very exciting. And of course, there are a lovely tea rooms on the platform. Other events that take place are murder mystery evenings. Depending on the theme, virtually everyone who attends is in fancy dress, it’s a wonderful sight to see, and a fabulous evening out, not too mention really reasonably priced. A pair arrived as a camel to our Arabian themed murder mystery! The evening starts with food served Platform 1 where the plot unfolds. Actors play out further scenes on the train & all you need to do is guess who, it is great fun! The next event is Saturday May 8th – The Baker Street Murders, where you’re invited to turn yourself into Sherlock Holmes for the evening to solve the mystery. The trains run most weekends and the journey is really wonderful, as well as a great idea for a mother’s day treat, so if you’re near North Wales, do go soon! Now, Mary Kate is Irish, through and through, so I thought it would be fitting to share a few thoughts about St Patrick’s Day, on 17 March to celebrate the day. St Patrick is the patron saint of Ireland of course, but for me, the day is all about celebrating your Irish heritage, and testimony to the scattering of the Irish are the parades that have taken place for centuries in countries all around the world. I can trace my own roots back to a potato famine, where my Irish relations fled to Wales rather than starve. The tradition and celebration of this day and the time of year did put me to thinking of other Irish traditions. I know many of you familiar with the film “The Quiet man” will recall Michaleen Oge Flynn, the “shocklhorn” or matchmaker, who formally introduces Sean to Mary Kate. Sean just planned to “honk his horn” to have Mary Kate a running but Michaleen advises that there is a route that needs to be taken, customs that need to be followed. Mary Kate & Sean are both impetuous, and having waited for the approval of Mary Kate’s brother, a tricky and lengthy negotiation, the pair escape the eagle eyed gaze of their watcher, and end up in an old church yard in the rain, with a shared passionate kiss that is for me the most romantic scene of the film, or any other film for that matter. No St Patrick’s Day would be complete without a song, and I admit a romantic bias for my absolute favourite Irish song in all the world “O Danny Boy”. I have such strong childhood memories connected with the singing of this. “Danny Boy” was originally said to be intended as a message from a woman to a man but has been interpreted by some listeners as a message from a parent to a son going off to war or leaving as part of the frequent massive Irish emigrations that took place. The song is widely considered an Irish anthem, and trite as this may sound, I confess I can never quite make it to the end without a glimmer of a tear in my eye. Have yourself a very special St Patricks Day – and see the opportunity of celebrating the day as a gift. Find a parade, go to Dublin Saint Patrick Day on Wednesday 17th March, London St Patricks day celebrations takes place on Sunday 14th March, the Manchester Irish Festival also looks great fun. Dress up in green, make a cake decorated with shamrocks, sing a few songs, have afternoon tea, with a strong cup of your favourite Irish blend, invite some friends around to celebrate. Above all though, my hope is that this blog gives you the impetus to change your plans for 17th March, and provides you with the motivation for you to connect with those who are important to you, to celebrate your friendship together, to create your own traditions, to remember that part of you that is forever Irish.